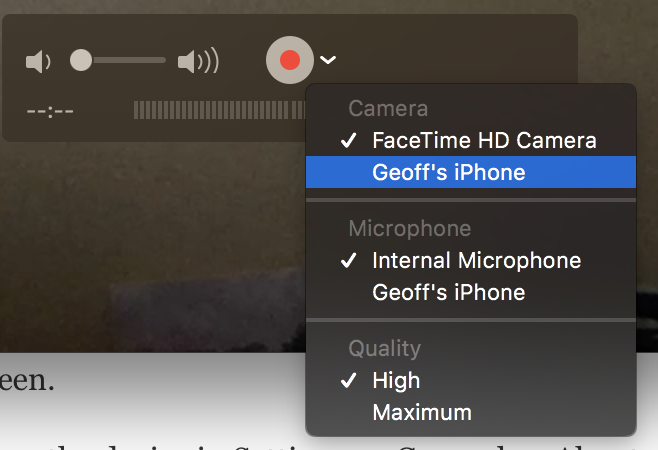 The easist way to record your iOS device for a demo is with the Quicktime Player on macOS. This feature was added in macOS Yosemite. Choose New Movie Recording from the File menu. When the Movie Recording window opens, you will see the Record button (a red circle). Next to it is a popup menu icon shaped like a small v. Click that. Choose your iOS. You’ll see your device’s screen appear in the Movie Recording window. If you’re going to record your voice while doing the demo, make sure you choose Internal Microphone or use an external one if you have one. Otherwise, the QuickTime Player will default to using the iPhone itself which won’t sound as good. You have two choices for the quality level. I suggest using the default choice (High) unless that turns out to be unsatisfactory. For most uses it will be fine and produces much smaller files. Click Record to record your iOS screen. Do all the steps for your demo. When you’re finished, click the Stop button. Save your recording and later you can use File -> Export to save in various formats and sizes based upon how you’re going to use the demo video you’ve made. Note: The name of the iOS device can be found on the device in Settings -> General -> About -> Name. The QuickTime Player has some decent functions for clipping and trimming your video as well. If you need titles and more sophisticated features for your demo video, iMovie or Final Cut are great solutions.